The Federal Rules were amended effective 12/1/2012. Click here to view the amendments. Please note there is a new B10 form for filing a claim. The new form can be found on the Forms page of the Court's website under All Forms. Click here to view the new form. The bankruptcy court now accepts claims filed electronically. Please note that electronic claims cannot be filed in cases with an assigned claims agent. In addition, the electronic claims system does not require a username and password and is not accessed through CM/ECF. The Court's electronic claim filing system is accessible through the "Filing a Claim" link on the Court's website. That link is located on the front page of our website and is also found under the "Programs & Services" tab at the top of that page. Claims filed electronically appear on the claims register for the case number entered. For more information on how to file an electronic claim, please review the electronic learning module on "How to File an Electronic Claim," located on the "Filing a Claim" page. The newly proposed local rules will be posted on the Court's website for notice and comment within the next few weeks. Beginning in February, Legal Services Corporation of Delaware will be available to provide assistance to pro se debtors filing consumer cases on the Monday prior to and the Tuesday morning of Sheriff's Sales. A Pro Se coordinator will be on site in the intake area of the bankruptcy court. More information will be available on the Court's website in the near future. Pursuant to the ability to electronically file claims, Local Form 103 (Chapter 13 Plan) has been revised to provide instructions for filing an electronic claim. Please ensure this updated form is utilized when filing the Chapter 13 Plan. The form is located on the Local Forms page of the Court's website. 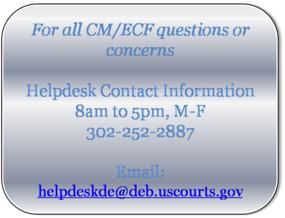 Prior to filing a large batch of new adversary proceedings, please file one then contact the Court's Helpdesk to ensure all aspects of case opening were done correctly. This will alleviate the need to make numerous corrections in a large amount of cases.